So many good flavors in this Thai-Inspired Ground Turkey Stir-Fry with Basil and Peppers. I've mentioned how I'm working to embrace ground turkey, after years of thinking it was rather bland in the flavor department. 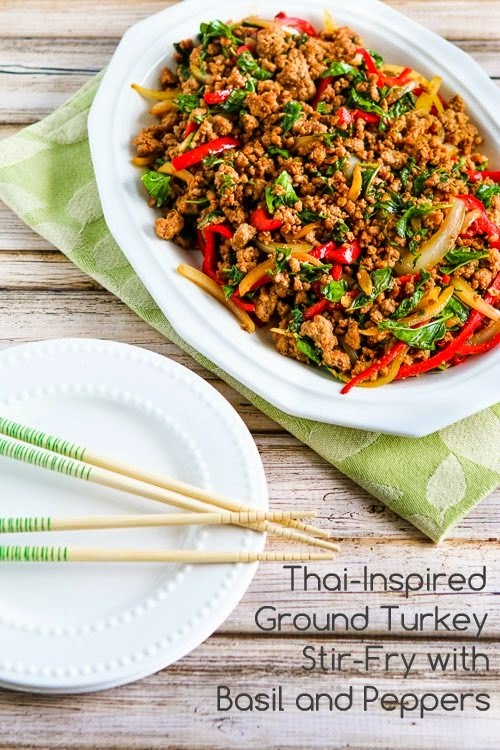 And lately I'm really loving it, especially when it's in a highly-seasoned recipe like this Thai-Inspired Ground Turkey Stir-Fry with Basil and Peppers. In this dish the oil is seasoned with onion onion and garlic, and then the cooked turkey is flavored with a stir-fry sauce that has fresh-frozen lime juice, Red Boat Fish Sauce, Sriracha Sauce, Tamari Gluten Free Soy Sauce, and just a touch of Agave Nectar. With the addition of red bell this recipe has the sour-sweet-spicy-salty-bitter flavor notes that make Thai cooking so distinctive. If you're new to stir-frying, you might want to read the basic rules for stir-frying that I learned many years ago when I studied Chinese cooking. Once you've mastered those basic techniques, you can make an endless variety of good-tasting dishes!